...I put a couple of .22's behind it's ear in June of 2001. So, you're saying that it has a really bad headache? It was giving me one, I started drinking Crown at noon! I hate the industry's reps! Does anybody have an opinion about the Huggers? 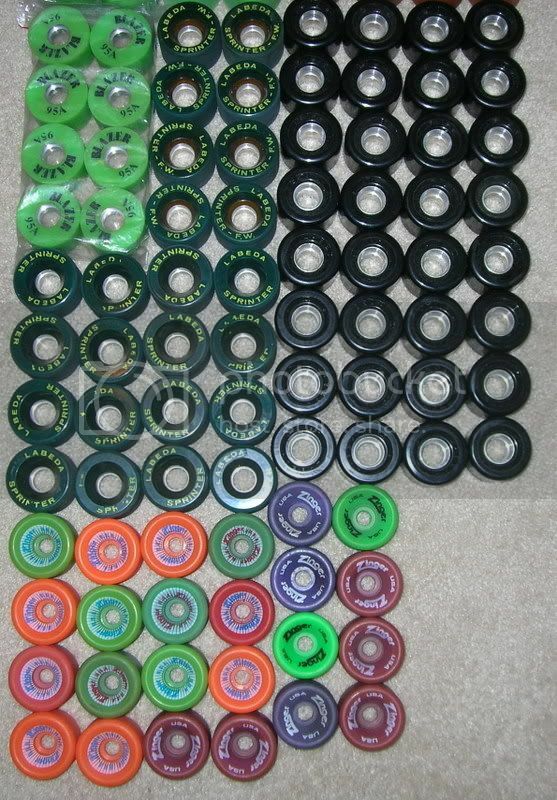 I want them, I need them, I love them. That was THE WHEEL prior to the Fanjet. I still have a pair of Hugger originals, kind of wore out, super lights same thing and a pair of fan jets that have never been broke in...They are in Indiana at my mothers house. Lets See Huggers Were White Somewhere Around $80.00 A Set And After 200 Laps Or So They Faded To A Cream Color And They Were No Good For Competing Anymore. And I Put A Set Of The Old Green Blazers On Them. The Blazer Is A Smaller Wheel About The Size Of The Old Wooden Wheel. 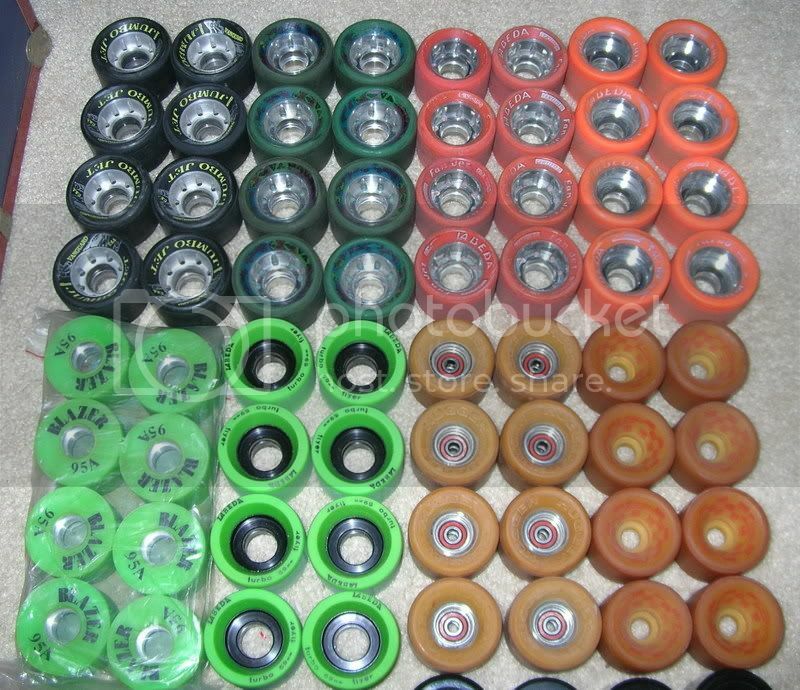 Which Is A Good Size For Young Racers. It's interesting to point out that Tony and Dante still hold national records from the mid 80's. What was the deal with the floor at the 85 and 86 nationals? Conditions must have been perrrrfect. 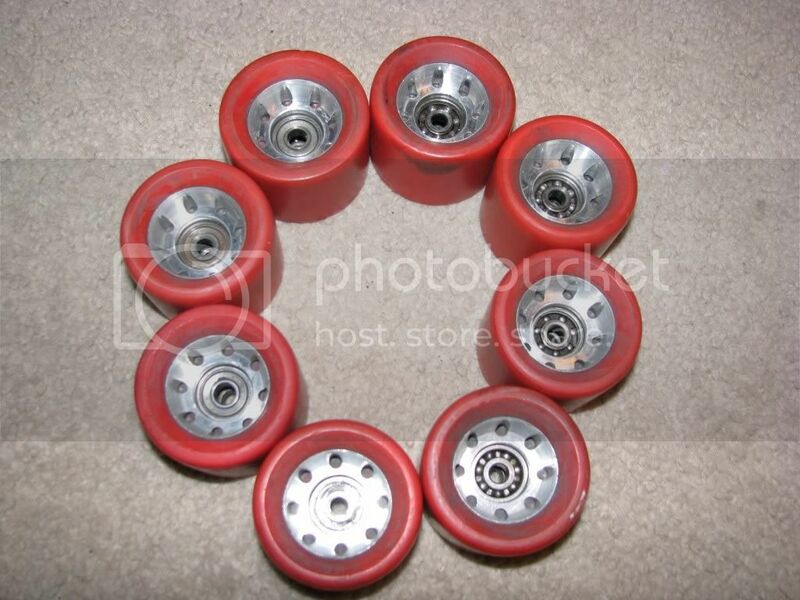 What were the wheels back then.....I think they were Labedas. Anybody else recall? 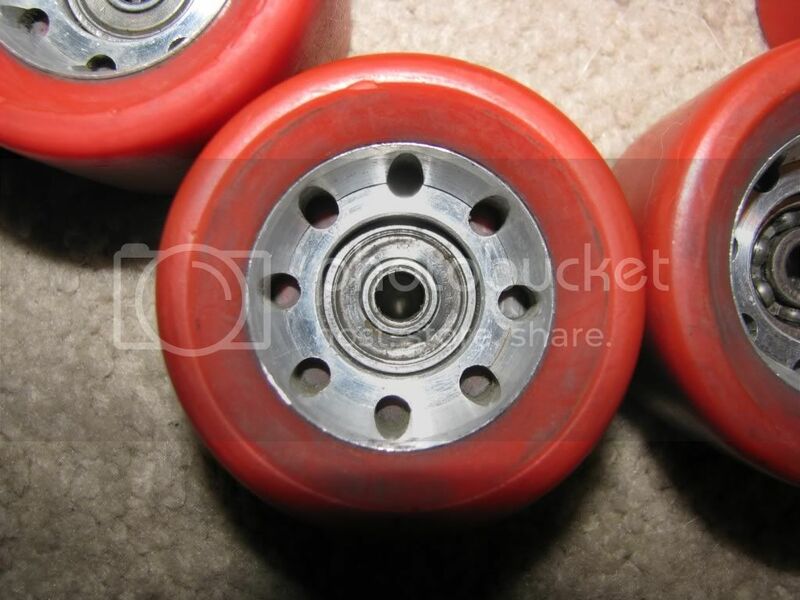 The wheels still have some grooves on them and the bearing at least turn....And they have spacers in them, whoo hoo. 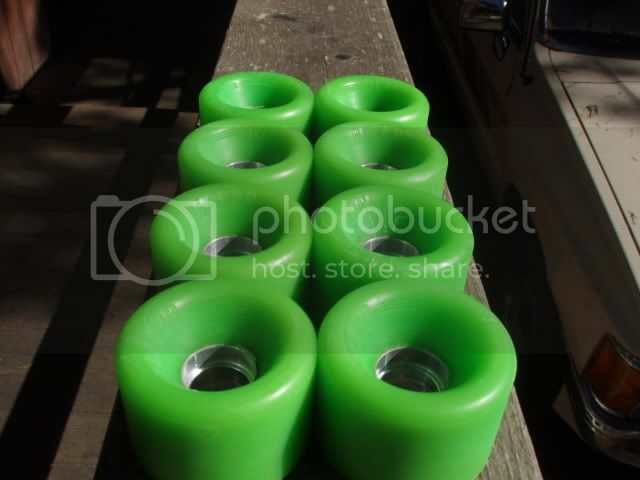 anybody need a set of skates for cheap? 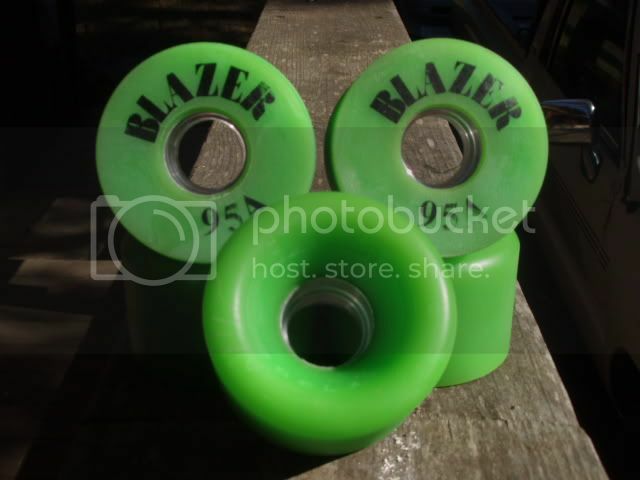 they are white with a silver inner sleeve that looks like racing rims..
Do you have any new outdoor wheels in 100 mm and I may trade you for the fan jets if they are good.. I will call my mother tomorrow and tell her to send them to me then I will take some picks for you. They will not be here soon and I am leaving for 3 weeks to Turkey for an AEF but if you are patient we may work something out. My orange blazers had no sleeves in them they were rubber where the bearing went in. Yeah, I wonder where they came from? After reading this thread I went into the garage and pulled these out. I have had these for over 20 years and I can't remember what kind they are. I used to have satellite plates as well but I don't know where they are. The trucks were still attached to the wheels.